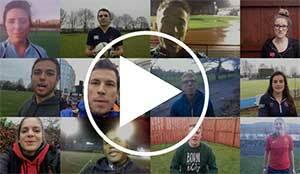 From runners to footballers, hockey players to rugby players, sportspeople up and down the UK have been making their commitments and longings known (see video right). As Christians in Sport’s invitation puts it: “What is your prayer for your world of sport in 2017? Whether you are a player, official, coach or however else you are involved in sport, what would you love to see God do in the next 12 months? Maybe your prayer is for a teammate to come to faith in Christ or perhaps you long for more opportunities to speak of Him among those you train with?